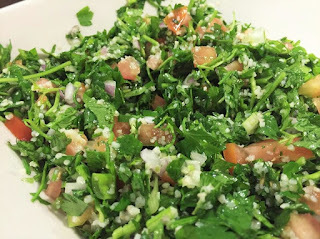 NouJi Creations: How to make the Healthy "Lebanese Tabbouleh"? 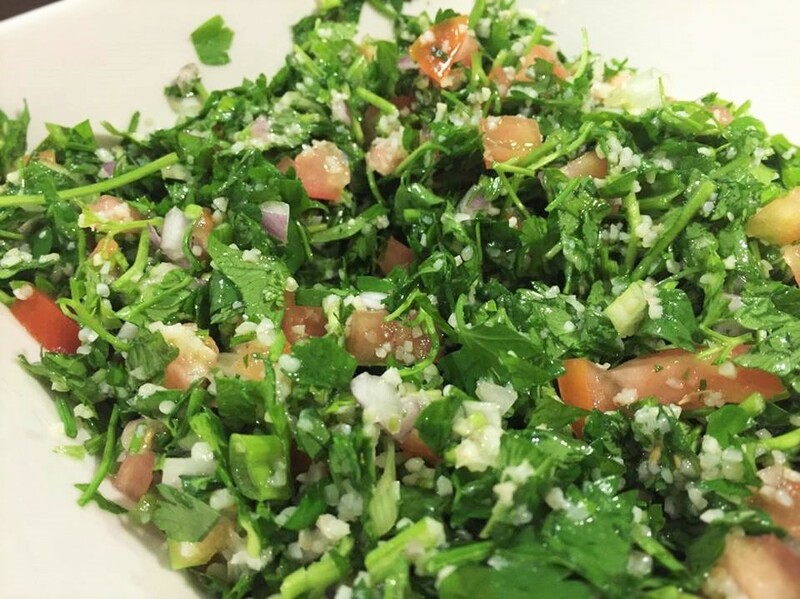 The Lebanses Tabbouleh (also pronounced as Tabouli) is a healthy, rich green salad with pure Lebanese origins. - Green Mint is a blood cleanser. It also soothes the digestive tract, eliminates toxins from the body, reduces the growth of bacteria and fungus and helps in curing asthma. In addition, it whitens teeth and combats bad breath and help preventing colon, skin and lung cancer. - Spring Onion is anti-viral, anti-oxidant, anti-inflammatory and great for the eyes. It maintains healthy heart, helps preventing arthritis and cancer, lower cholesterol and blood pressure, reduce nasal congestion. - Cucumbers are full of water, anti-cancer, laxative and Diuretic. They ease heartburn, acid stomach and Ulcers. In addition, they dissolves kidney and bladder stones, kill bad breath causing bacteria, regulate blood pressure and cures headaches. - Tomatoes are anti-inflammatory. They reduce heart disease, lower risk of stone formation, lower cholesterol; reduce migraines and help preventing cancer. In addition, they purify blood, boost immunity, improve bones and promote healthy skin. - Red Onion is antiseptic, anti-spasmodic and anti-biotic. It assists with asthma, detoxifying of metals and parasites, helps preventing cancer, protects brain, strengthens bones, aids digestion and purifies Blood. 1. Put the bulghur in a bowl, cover it with an inch with water (it will double in size), and let it sit at least 20 minutes. 2. After rinsing and chopping all vegetables, let dry and spread them on paper towels to rest for a few minutes in order to get rid of the moisture. 3. 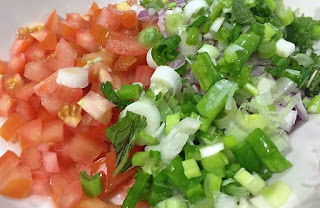 Add the parsley, green mint, spring onions, cucumber, tomatoes and red onion to a mixing bowl. 4. Squeeze any remaining water out of bulghur and add it to the vegetables. 5. Add lemon juice, olive oil, salt, and pepper then mix lightly with a fork and avoid over-mixing so it doesn’t turn soggy.